A much-awaited Startup Pakistan Program has been launched by the Prime Minister of the country. The startup ecosystem of the country has been one of deep interest for international and local investors yet it lacks the clear direction. Multiple small and large companies are running incubation centers and accelerator programs yet the county is far behind from the eco-system of their neighbor, India. One of the biggest advantages Indian startups have is the support and encouragement by their government and have taken multiple steps to ensure the betterment of the country’s startups. 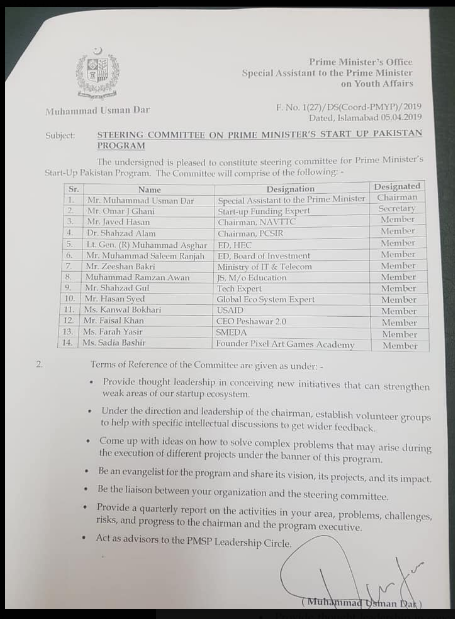 Pakistan’s Prime Minister Startup Pakistan program has known names in the steering committee and a lot of eyeballs are set on them as to what steps they’ll take in order to help flourish the entrepreneurial ecosystem of the country. What do you think of this committee and initiative? Let us know your views in the comments section below.